Like other campers, truck campers come in many shapes and sizes. From small pop ups to large units that extend out the back of your truck and some even have slides. They are considerably pricey compared to their towable cousins but offer a very versatile option for people camping on the go or wanting to tow a trailer or boat with them. When we make our yearly trips to the shore in Delaware we take two vehicles. Our big truck pulls our fifth wheel and our SUV tows my parent’s boat. We have also taken day trips to places like Raystown Lake but that’s a long way to go for just the day and dragging two vehicles every weekend isn’t convenient. We’ve been talking for some time about wanting to travel more on the weekends and joked originally about a truck camper. In my head it was just a joke since we already have our fifth wheel and didn’t want to trade that for something tiny. With the thought behind us (or me anyway), I started researching tents. I don’t love going back to a tent, but the adventure of it all seemed a bit exciting. We looked at truck bed tents, small dome tents, large multi-room tents and everything in between. Somehow through all that, we ended up back at truck campers, but were discouraged at the cost and any that were affordable sold immediately. We missed out on more than a couple because we weren’t fast enough to jump. It almost turned into a game for us searching latest listings during lunch breaks and in the evening. We eventually found one fairly local and from the photos we were excited and ready to buy it. 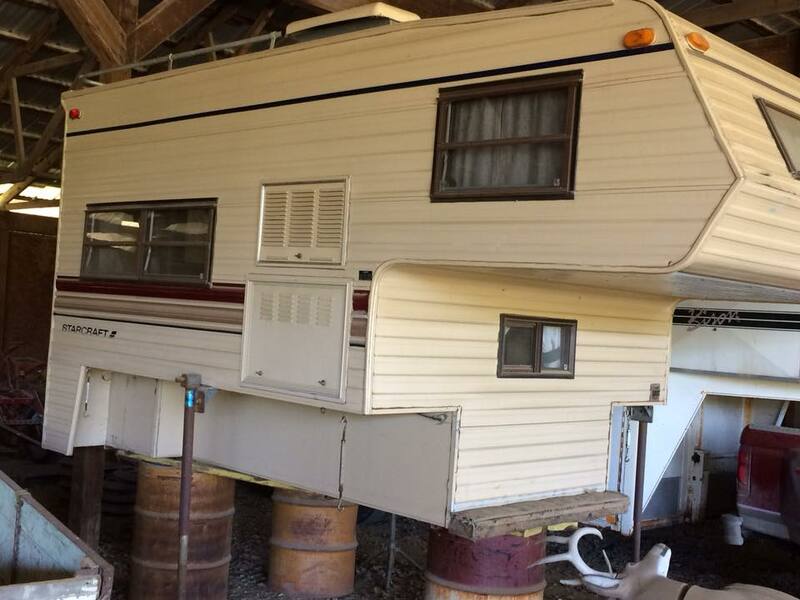 When we contacted them to see it and make our final decision, the owner more or less talked us out of it because of how it would fit in our truck. After some research, seeing it in person we agreed to buy it and now the little lady is ours. She’s old but extremely well kept and with some updating, she’ll be a fun little “house” for us to rest our head on our weekend trips. I can’t wait to share all my ideas with you!